Schlliterbahn is one of the best waterparks in the country! It is a great value where you can get all three parks for one great price of about $45 per adult. In German, the word Schlitterbahn means slippery road. 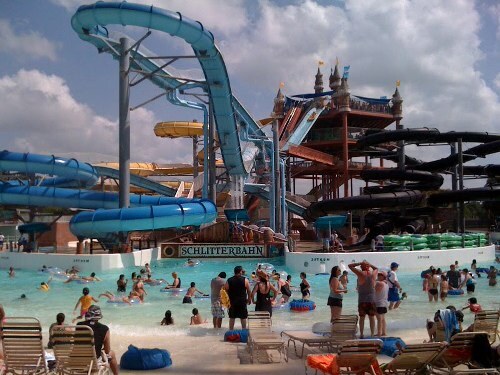 Schlitterbahn is the largest water park in Texas. Schlitterbahn West, also known as the Original Schlitterbahn, is home to the park's signature German-inspired tower. This section of the park has a decidedly German theme, paying homage to its German ancestors. The most popular rides in this section are the spring-fed tube chutes like the Raging River Tube Chute, the Hillside Tube Chute, and Whitewater Tube Chute. Admission starts from $45 and up! saya naman dito ... and the slides wooowww! Parang mahihimatay ako sa haba ng slide but it looks fun. That was a fantastic water park with fantastic rides and sight. It was way way better than the theme parks here in the Philippines. Thanks for the post. God bless you all always.